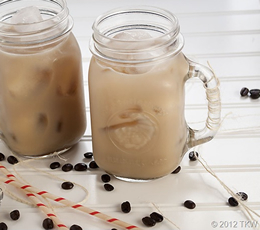 No, it’s not ice coffee…more like a chocolate milk…but a coffee milk! And it’s delicious. Thank you to thekitchenwitchblog.com for this wonderful inspiration! Pour coffee into a medium sized sauce pan, heat over medium low heat until coffee is reduced by half. Remove from heat and immediately add 1 cup sugar, stir constantly until sugar is dissolved. Store in refrigerator until ready to use. To make coffee milk: Fill a tall glass with ice (if desired), add milk and 1 to 2 tablespoons coffee syrup (more or less to taste), stir well to blend.